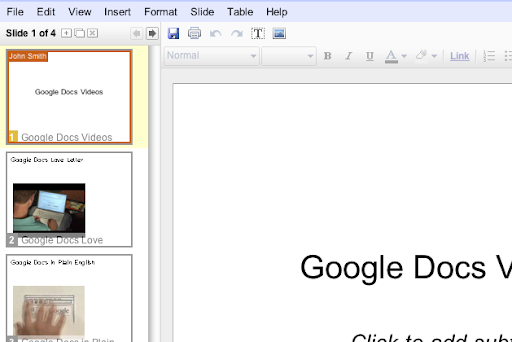 Most of you know that when you co-edit a Google Docs spreadsheet, you can see the cells other people are editing. That presence information helps you simultaneously edit without stepping on each others' toes. Today, we launched real time presence to Google Docs presentations as well. 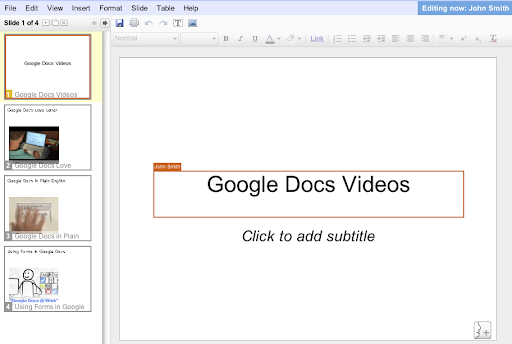 Now, when editing a presentation with a co-editor, you can see which slides he is editing, and if he is editing the same slide, then you can see which element -- text box, shape, image, video, etc -- he is editing. Happy collaborating, and we'd love your feedback on our forum and ideas page.